CrystaLaser, founded in 1995, located in Reno, Nevada, with over 7000 sf manufacturing facility, is a leading manufacturer of ultra-compact diode-pumped solid-state (DPSS) laser systems and accessories. 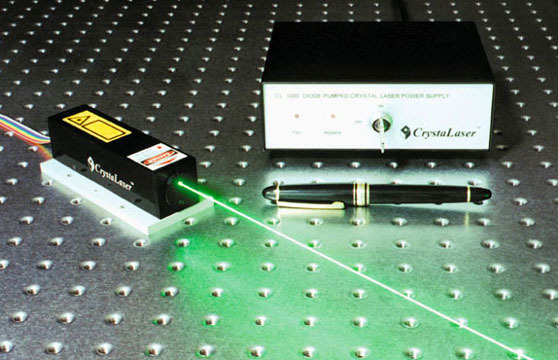 CrystaLaser designs, develops, manufactures and services diode-pumped solid-state lasers in ultraviolet, visible blue, green, red and near infrared wavelengths in the USA, for scientists, engineers and original equipment manufacturers around the world. The laser products are well recognized in scientific and industrial laser community all over the world. The diode-pumped crystal lasers are based on our proprietary coupled-cavity laser technology. This global patented technology allows the green, blue and infrared solid-state lasers to operate in a single longitudinal mode and TEMoo mode with low amplitude noise, increased laser output power and efficiency in an ultra-compact housing with very low power consumption. CrystaLaser offers true CW lasers and Q-switched pulsed lasers in the wavelength range from ultra-violet, blue, green, yellow, red to infrared, and the output powers from 1 mW to over 3 W. CrystaLaser's diode-pumped solid-state lasers are highly reliable, highly stable, extremely efficient and have excellent laser beam quality. We take great pride in the performance of our laser systems. It is no wonder that diode-pumped crystal lasers is rapidly replacing gas lasers and other lasers in a broad range of applications including data storage, holography, optical communication, fluorescence, seed laser, interferometers, biomedical diagnostics, flow cytometry, DNA sequencing, medical treatment, laser trapping, materials processing, laser entertainment and optical alignment as well as scientific researches. CrystaLaser is committed to supply the most reliable, most stable, highest efficiency and best performance ultra-compact solid-state crystal lasers to our customers. CrystaLaser has state of the art technologies, the experiences, the products and the people to help you succeed.